Insufficient physical activity worldwide has become an epidemic on a monumental scale. According to a WHO report, an estimated 1.4 billion people are not doing enough exercise to maintain adequate levels of fitness which puts them at greater risk of heart disease, type-2 diabetes and various forms of cancer. To help combat these important issues, we’re going to look at 4 different ways to keep ourselves fit and healthy. Resistance training involves working against some type of force that resists your movement. Workouts can include using weights (machine and free weights), bodyweight, suspension cables, kettlebells, medicine balls, resistance bands and many more interesting and fun pieces of equipment. Benefits associated with resistance training include improved posture, increased bone mineral density, improved sleep, increased self-esteem and increased muscular strength/endurance. Resistance training also helps prevent or control chronic conditions such as diabetes, heart disease, arthritis, back pain, obesity and depression. Participating in some form of resistance training at least once a week can help kick start these benefits. Developing healthy eating habits can seem like a daunting or tedious task for a lot of people, but it doesn’t have to be at all. Nowadays, everyone seems to follow a different diet. Many people swear by the paleo-diet, the blood type diet, veganism, vegetarianism, the keto-diet or just normal home-cooked meals. However, everyone seems to agree on a few key principles. 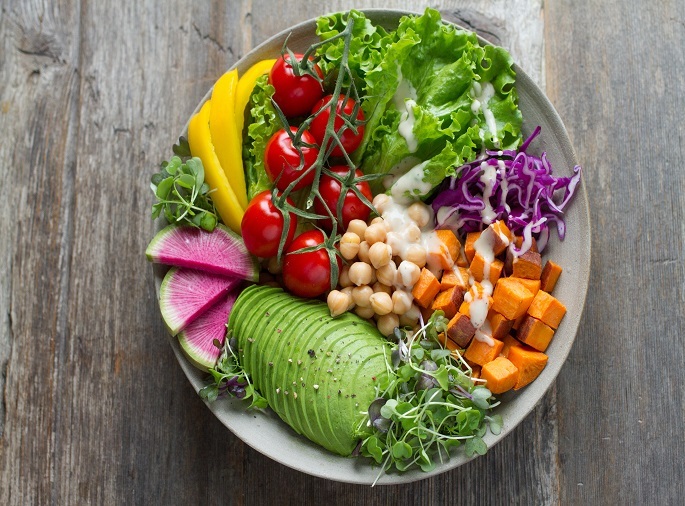 First off, it is essential to make sure you are getting an adequate supply of macro-nutrients – protein, carbohydrates and fats, and micro-nutrients – vitamins and minerals. Most people would agree that we should avoid processed foods as much as possible, and that our macro and micro nutrients should come from nutritious and natural/organic sources. A few tips to consider: 1) Keep an eye on the portion size. 2) Eat plenty of produce and a wide variety of foods. 3) Get more whole grains. 4) Choose food over supplements (unless needed). 5) Stay clear of trans fats. Don’t like training in a gym? Pick up a sport or active hobby that you can participate in several times a week. Staying active by playing a game of football with friends, or doing some indoor rock-climbing can increase the likelihood of long term adherence to exercise. If team sports aren’t your thing, try out cycling, swimming or jogging. The main thing is that you stay active and preferably by doing something you enjoy. Playing sports or doing something active can aid in disconnecting from work and other stresses in our day to day lives, which in turn reduces stress, improves overall creativity and helps your mental health. People usually tend to like training for long distances at lower intensity, while others enjoy training for shorter periods of time at much higher intensities. Long slow distance (LSD) training is a form of aerobic endurance training that usually involves running or cycling. It is performed at a constant pace of low to moderate intensity over an extended period of time. Some of the benefits include: 1) Increased utilization of fat for fuel. 2) Decreased risk of heart disease. 3) Improved cardiovascular function. 4) Improved VO2 max. 5) Stronger muscles, tendons, ligaments and bones. If you opt for something else, then High Intensity Interval Training (HIIT) might be the remedy you seek. Usually performed for 20-30 minutes, these workouts can be short but difficult and gruelling. There are many types of interval training systems out there, but most of them include a minute or less of high intensity physical exercise followed by a rest period. Usually the work : rest ratio is 1:1, 1:2, 1:3, and in some cases where the client might be extremely fit, a ratio of 0.5:1 is used as well. It is performed at 85-100 percent of one’s maximum heart rate. HIIT training has many benefits such as 1) Increased muscle tone. 2) Boosted metabolism. 3) Reduced body fat. 4) Wide variety of exercises to choose from to keep things interesting. 5) Improved energy levels.